Unruely...Welcome to this fine site...Seems you have joined with a "bang"...Nice rifles...Can I be added to your will? Nice collection, welcome to the site! 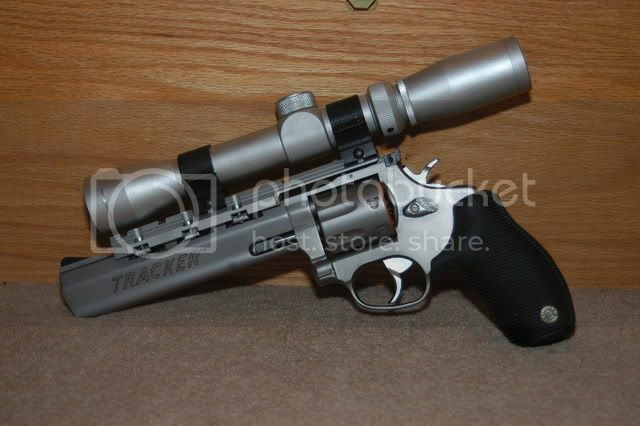 I have a question.....do you really need a scope on a pistol??????????? like the stock being as long as the barrel. my god those are big scopes are making up for some short sightness?? pretty wood the yellow one. seems a bit over the top though with satellite viewing scopes. 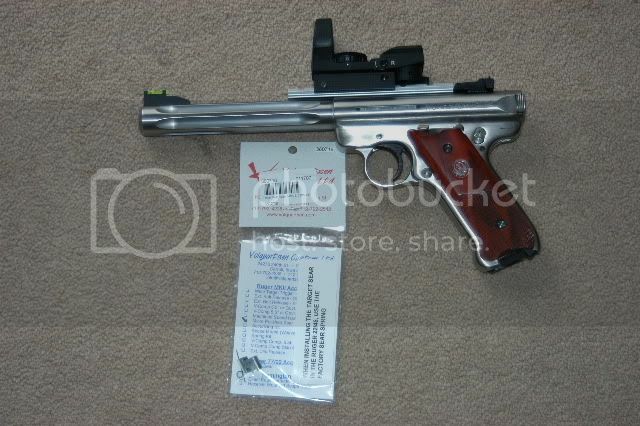 If one must have an addiction, what is wrong with a rimfire or two or three? A Ruger or four or fifty never is a bad thing. Welcome, drag up a stump, we do speak rimfire here bouts. how does one enter the competition shooting fest??? been in archery ones, now want to shoot the loud stuff. scared my eye might get dotted with one of those scopes. and should scopes be in competition? seems like a enhancer for better performance. just cant buy all the ones i want. had a Stevens 30 30 but it wouldnt eject the spent cartridge or load up right so took it back for the gunsmith to deal with it. neighbor kid brought his .243 and it made my head ring for a day. not sure what grain he was using. Good to be back with you Nuts, having a hard time catching up to all that Ive missed. 13+ hour days in the restaurant kept me away from here. Tourist season is full tilt and another restaurant closed and we have their business, and people keep quitting as well. Lost 3 cooks in 2 days. kids going off to college or on summer trips. Leaves little time for shooting bow or guns or writing with you boys. no pulleys, no stablizers, no scopes were allowed. it was all pure skill and techniquel. 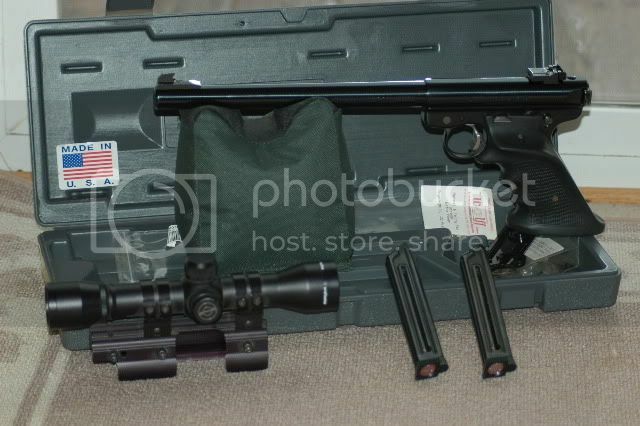 really dont understand the need for a scope on a pistol. I shot longbows in competition and were only allowed wooded arrows, that is still how I shoot and hunt today. 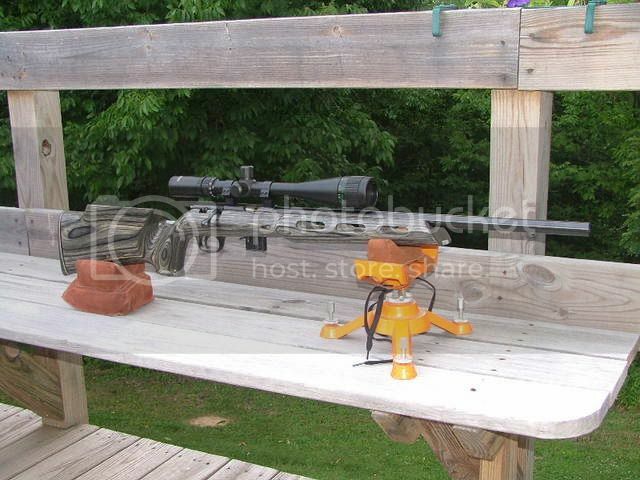 The scope on a hndgun can make a difference between a 1 1/2" group at 25yds and a 1/2" group at the same distance. If you were only allowed to use wooden arrows when you were shooting recurves rather than carbon, I bet you would have still been able to shoot good but maybe not as good as with the carbons. The way I look at it it is similar, an aid to achieve a higher degree of accuracy. both of these scopes are long eye relief scopes, 2-7x32mm's designed for handguns. Welcome to HuntingNut. Like your rimfires. You certainly have some good looking hardware. 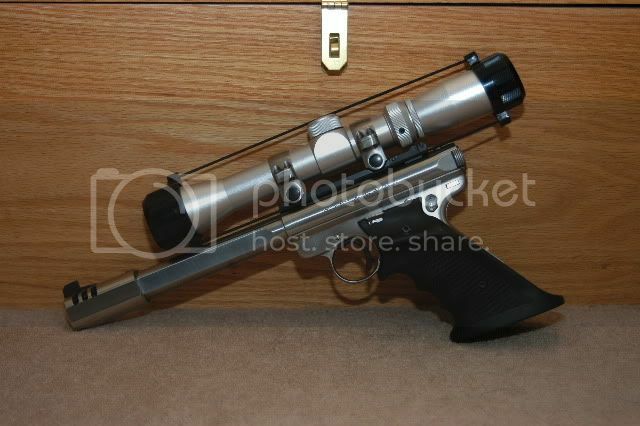 really dont understand the need for a scope on a pistol. please elaborate. Why scopes on pistols? 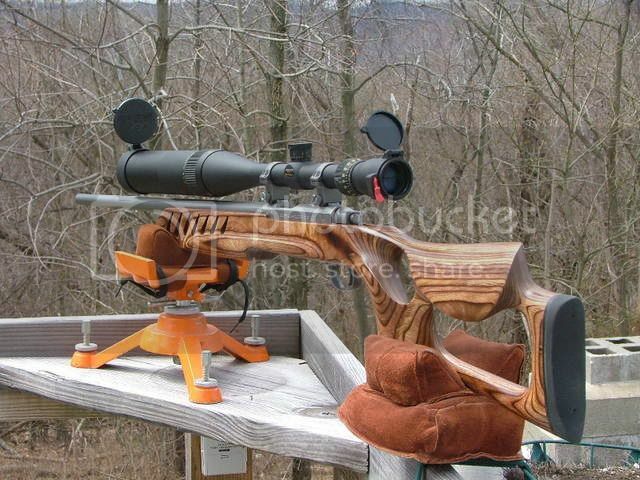 I do have some problems seeing squirrels and prairie dogs well enough to use iron sights past 50 yds. Then of course a few years of competing in IHMSA matches with iron sights on a pistol and targets at 200 meters convinced me that I should be shooting more pistol on little critters. So This was the result. 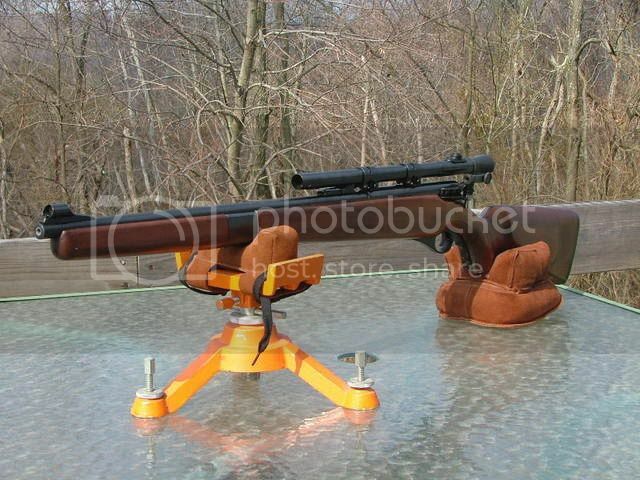 It is a Thompson Center Contender with a 12" barrel chambered in 17 Ackley Hornet. Has a 3200 fps velocity. 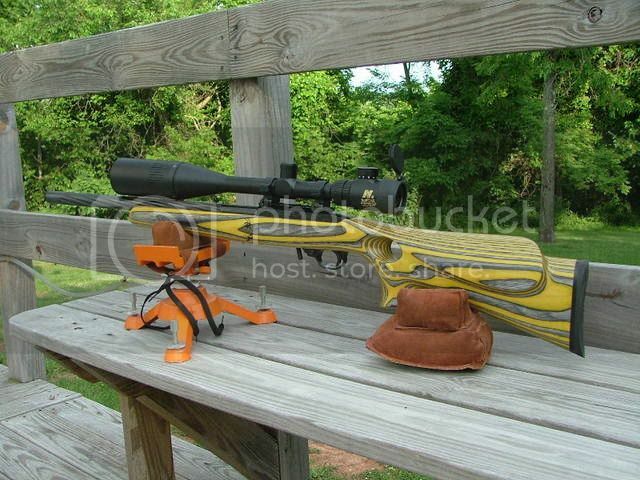 It is accurate enough to take a prairie dog at 289 yds. 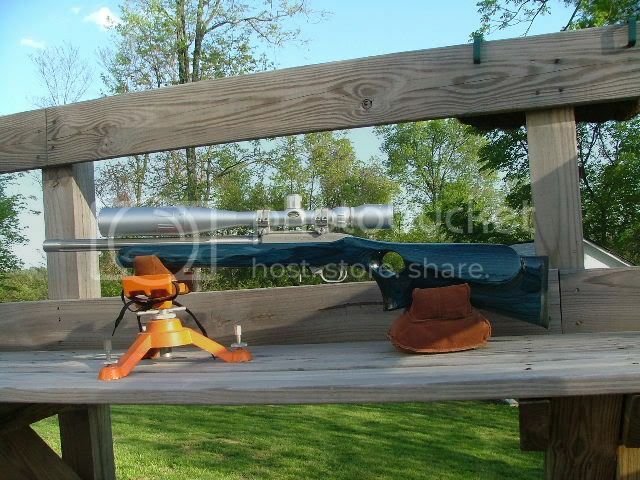 The scope in a long eye relief 3-12X pistol scope. 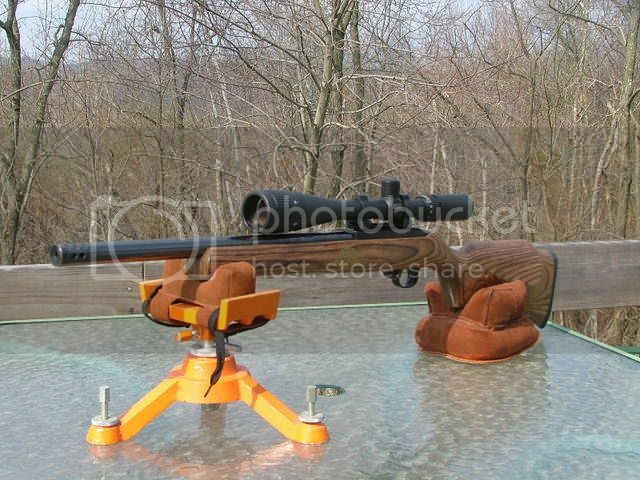 The rig has very little recoil and has approximately the ballistics of a 222 with a 45 grain bullet. 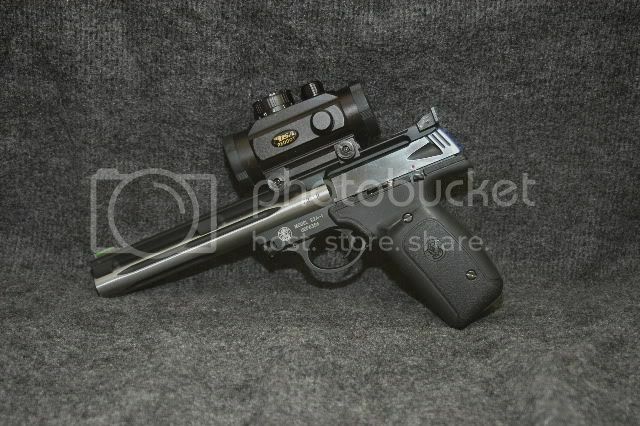 Pistols can fill the function of rifles and need appropriate optics. That 10" barrel on Unruely's Mk II has almost the same velocity and accuracy as a 22 rifle, so a scope helps use that accuracy. Welcome aboard Unruely. Pull up a piece of dirt, grab a beer and jump in when you feel the need mate. Like your collection of rimfires. Like you I have a few....5 at last count, although none of mine are customised like yours. 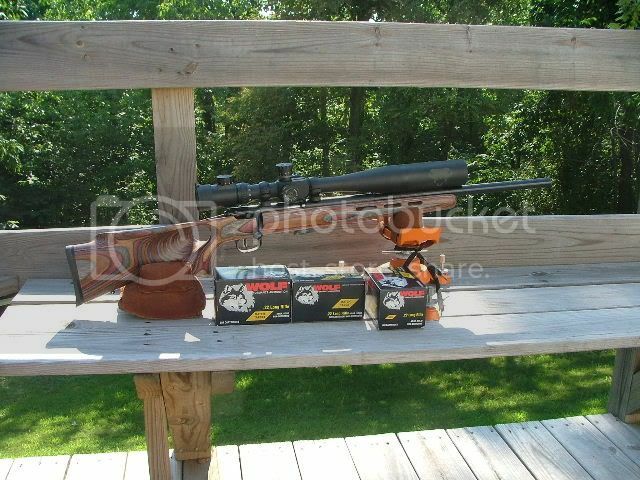 Its a great calibre (.22). Keetoowah.....some of us are gettin' a little long in the tooth and can no longer see the rear sight, fore sight and target in clear focus....I'm one of them. Eye Crutches (glasses) don't allow you to see all three in sharp focus so the obvious solution is a scope. Works for me. Nice firearms, but I have one question. Why in the world would you use Wolf ammo. in ANY gun, much less higher end ones??? I use a scope on my target .22s, and use a Merit Eye when shooting my .45ACP 1911s.